On this 13 day accommodated self drive tour you will visit one of the most fascinating countries in Southern Africa. Nowhere else in Africa can you feel such vast- and reclusiveness as in Namibia. 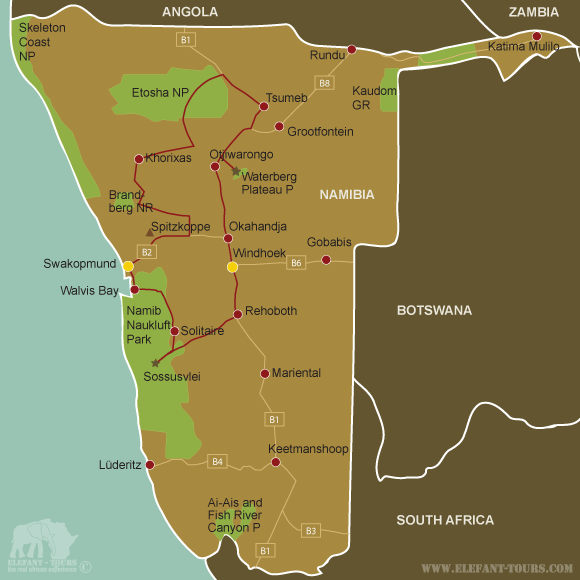 Despite its size of roughly 830.000 square kilometres, Namibia only has a population of 2,1 million. This phenomenon is easily explained by Namibia being the driest land south of the Sahara. The Namib Desert, the Fish River Canyon, the Etosha National Park and the fact that Namibia was formerly a German colony which till this day has left a mark, makes this country a very interesting and diversified destination to visit. After arriving at Windhoek International Airport, you collect your rental car and drive to the prearranged accommodation, Montebello Guesthouse. The rest of the day is at leisure and you can either relax at the guesthouse or explore the city. See the National Gallery (featuring local artists), the National Museum (Namibia’s history) or take a walk in the 12-hectare National Botanic Garden. Get a taste for some Namibian beer and enjoy traditional cuisine at a local restaurant (own account). You will overnight at Montebello Guesthouse. After breakfast you leave Windhoek and drive south via Rehoboth and the Remshoogte Pass to Sesriem. If there is time before sunset, you can enter the Namib-Naukluft National Park at the Sesriem Gate to see the late afternoon light on the dunes. You will overnight at a tented chalet at Desert Camp, situated just outside of the park where you have the chance of grilling meat on an open fire under the stars. Book a braai pack – a selection of meats and salads. Alternatively, you can go for dinner at Sossusvlei Lodge a few kilometres away. Try to get away as early as possible to see the early morning sun creating beautiful shadows on the enormous dunes of Sossusvlei. Gates to the park open at sunrise. Climb one of the famous dunes such as Dune 45 or Big Daddy for some early morning exercise. It is a breathtaking experience seeing the sea of sand around you. 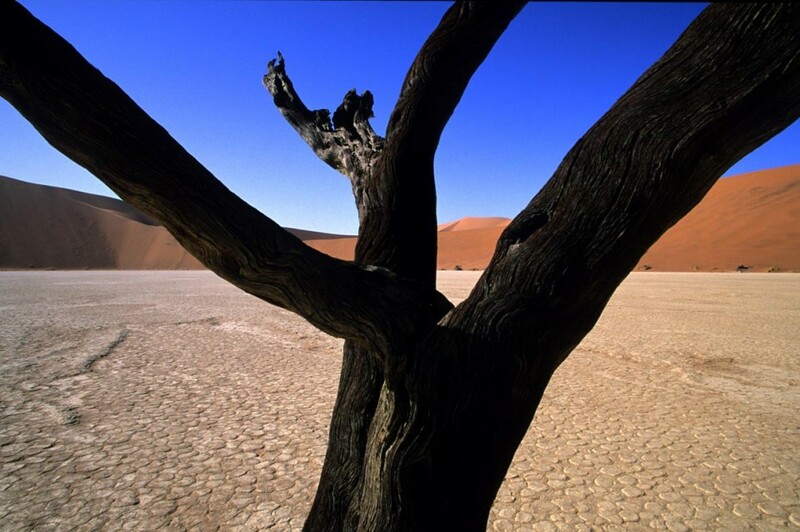 Continue to Dead Vlei, a very photogenic spot of ancient dead trees. 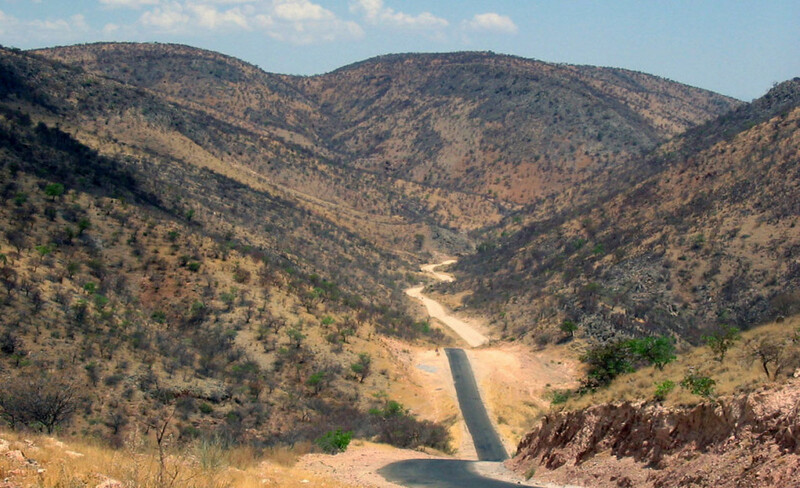 Thereafter you drive to the Sesriem Canyon where you can also do short hikes (dry season). 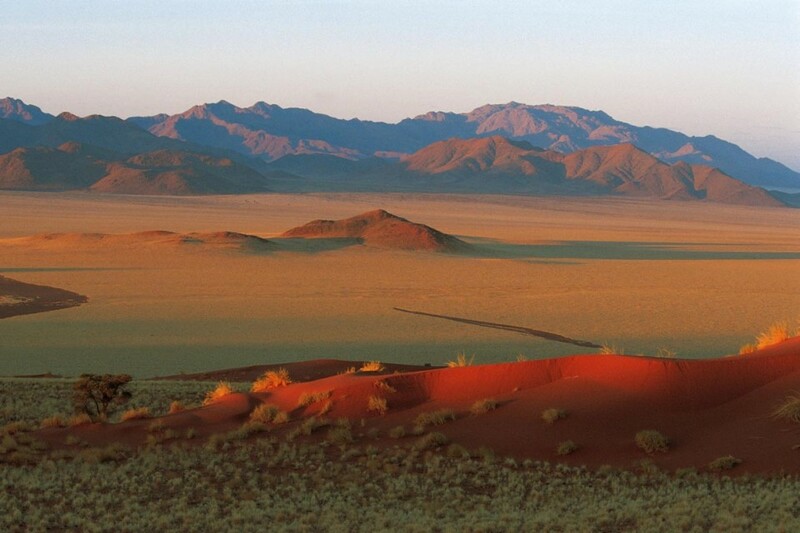 If you want to learn more about the Namib Desert, join a guided desert walk – book at Sossusvlei Lodge. You will stay another night at the Desert Camp. Today’s journey on gravel roads takes you to the coastal town of Swakopmund where you can find beautiful pieces of colonial architecture. Swakopmund is also a base for adventure activities (all optional) in the area – join a dolphin cruise in Walvis bay, go dune boarding, skydiving, fishing, take a heli flip over the desert, go quad biking, take a day trip into the desert or to the seal colony at Cape Cross. You will spend two nights at Cornerstone Guesthouse. There is a variety of restaurants to choose from, but be sure not to miss the fresh seafood. After a leisurely breakfast, you leave Swakopmund and travel inland. In the distance, you will see the Spitzkoppe, one of Namibia’s most recognizable landmarks. Go for a walk and explore the imposing granite rock formations or take a guided tour and view ancient San rock art. Today’s destination will be Onduruquea Lodge in the Erongo Mountains. Lean back and enjoy the warm atmosphere of the lodge. Alternatively, join a private game drive in the morning, evening or even at night. You will spend two nights at Onduruquea Lodge. Today you will head west past the Brandberg Mountain (2,580 metres), the highest mountain in Namibia and site of the ‘White Lady’ rock painting. En route, you may want to see the Petrified Forest, a collection of ancient mineralized tree trunks. 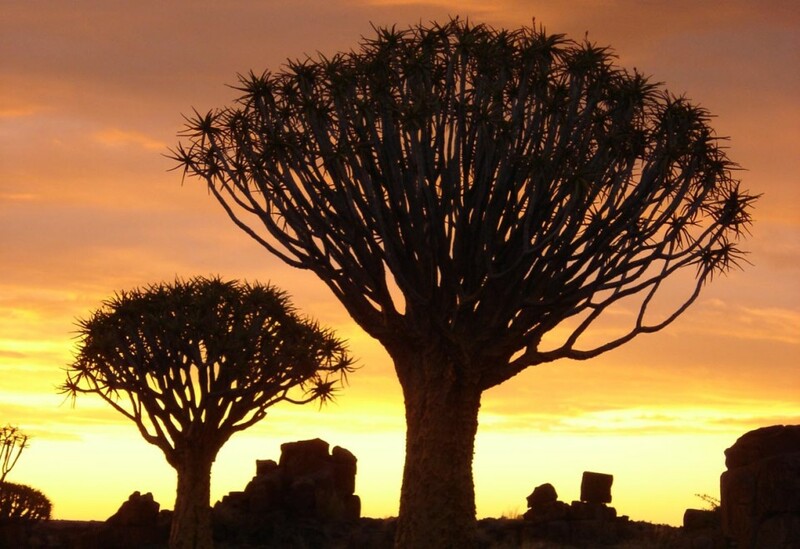 You might also find ‘living fossils’ – centuries-old Welwitschia plants. Overnight accommodation is at the luxurious Camp Kipwe, part of a sustainable eco-tourism and community upliftment project. This unique lodge is built from natural materials from the area, almost merging into the mountain it is built on. Enjoy the view of the boulder-strewn savannah or get into an open game vehicle for a tour (optional) around the property to meet the locals, see wildlife or some rock art. The lodge is close to Twyfelfontein, the Organ Pipes and the Burnt Mountain. After breakfast you depart for the world-famous Etosha National Park. Etosha (‘huge white area’) is one of the largest game parks in Africa and with its range of animals and landscapes – acacia trees, vast open plains and a massive salt pan – also one of the most interesting. Okaukuejo Camp is a good base for game drives in the western, central and eastern part of the park. During these two days, you will spend most of your time game viewing around the waterholes where elephants, giraffes and different species of antelope and birds come to drink. With a bit of luck, you might even be able to spot lions and rhinos. To see nocturnal animals, a night game drive (optional) with a park ranger is a good option or visiting the floodlit waterhole at night – very thrilling. You will overnight at the Okaukuejo Rest Camp for two nights. The large camps in the Etosha National Park are owned by the government. They are maintained and looked after by state employees who are sometimes not as enthusiastic about their work as we wish they were. Accommodation ranges from basic chalets to standard self-catering units. There are, however, more luxurious lodges outside the park from where you will do day trips into the park. Should you be interested in this option, please let us know and we will gladly amend our offer accordingly. After breakfast you will continue east, driving along the edge of the flat salt pan that extends into the horizon. 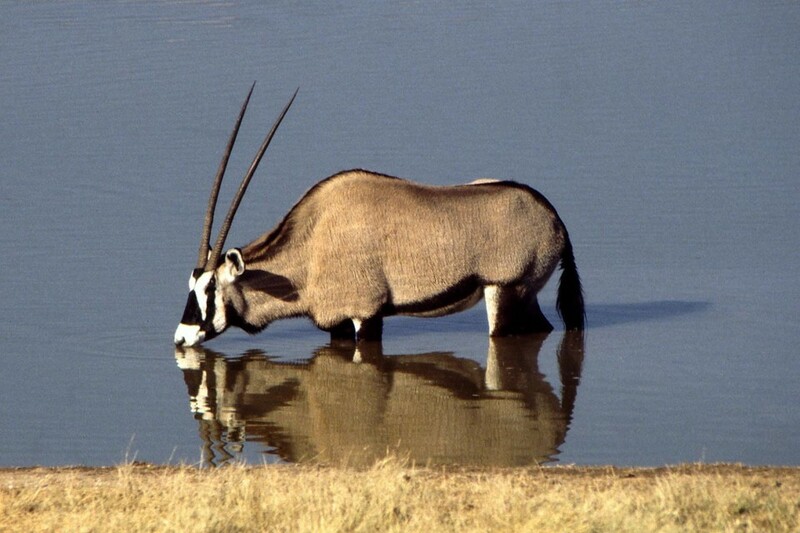 You will see herds of impalas, wildebeests, zebras and oryx on the plains. Amongst the acacia trees and shrubs look out for elephants, giraffes and lions resting in the afternoon heat. Stopping at waterholes along the way, you should see a variety of birds and animals coming and going to quench their thirst. By late afternoon you will reach Von Lindequist Gate where you exit the park. Mushara Bush Camp is just a stone’s throw away. Relax on the private deck of your tent-room in the bush or warm up at the campfire of the dining area. Today’s journey will take you past a deep lake and a meteorite. Just outside Tsumeb you can turn off to visit the bright blue Lake Otjikoto. Next on today’s list is the 60-ton Hoba Meteorite; at roughly 3×3 metres, it is the largest meteorite in the world. 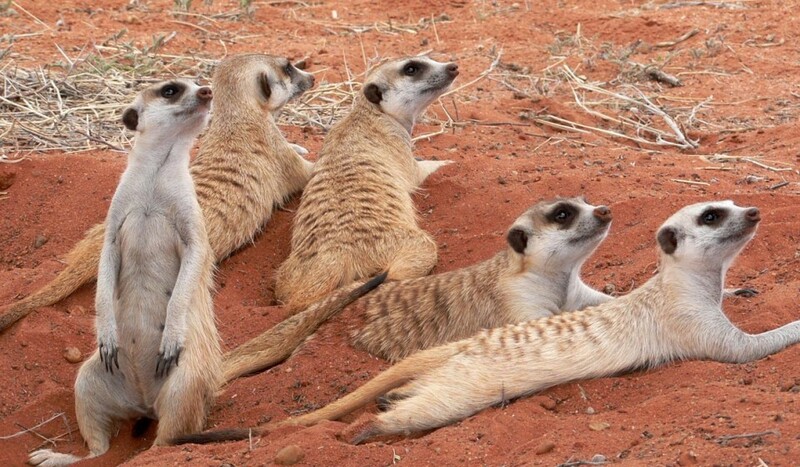 Your last stop is the private nature reserve Waterberg Wilderness. The Waterberg is a massive red plateau rising 200 metres above the surrounding plains. The variety of microclimates – mountain, valley and plains – accommodates a variety of vegetation ranging from massive fig trees to ferns and acacia trees. A variety of animals are found here, including over 200 bird species. As an optional activity you can join a rhino drive in the afternoon or take a walk along one of the well-marked trails. You will overnight at the Waterberg Wilderness Lodge. Today you will continue south towards Windhoek. On your way, you may want to stop at a curio market in Okahandja. Here you can haggle and bargain for wood carvings, beaded jewellery, baskets and other crafts. In Windhoek, you will head to the airport to return your rental car or spend another night in the city (optional).